These same heart attack-like symptoms can also be caused by a gall bladder attack when bile flow is impaired. (The gall bladder is an organ that squirts bile into the digestive tract to digest fats and oils as they are consumed.) In fact, a gall bladder attack may often be confused symptomatically with a heart attack. Sure enough, I talked on the telephone to a doctor/friend who recently experienced a heart attack and the day after his heart attack he reports his stool was brownish-green, an indication of excessive bile. Bile, produced in the liver, removes cholesterol (lipoprotein) particles from the body including an overlooked lipoprotein — lipoprotein(a). Due to iron overload bile will thicken and not flow well and cholesterol may accumulate in arteries, in particular lipoprotein(a). A gall bladder attack may not only be confused with a heart attack, it may also precipitate a heart attack. Thick bile forms, likely induced by iron overload and vitamin C deficiency. Bile backs up and is experienced as heartburn from bile acid, not stomach acid. Lipoprotein(a) is then elevated in the blood stream which is known to replace ascorbate (vitamin C) within artery walls. Vitamin C repairs even the slightest wound to the inner lining (endothelium) of coronary arteries (arteries that supply the heart with oxygenated blood). But when vitamin C is lacking, lipoprotein(a) takes its place and forms a “sticky” bandage that facilitates the development of blood clots. Don’t ignore symptoms of heartburn or indigestion that are relieved by antacids as these symptoms may be caused by poor bile flow that is also a sign that lipoprotein(a) levels are elevated. Do not ignore the appearance of dark-green stool that is also a sign of high bile levels. Static bile flow (stasis) may then result in sticky blood clots being formed in coronary arteries if vitamin C deficient. Thick bile is induced by iron overload, particularly in males, and elevated iron levels, as measured by the iron storage protein ferritin, also increase lipoprotein(a). [Journal Stroke Cerebrovascular Disease Oct 2013] Note: a healthy ferritin level is between 20-70 micrograms per liter of blood. If you have already experienced a heart attack or want to prevent a first-time heart attack, you need to supplement your diet with any of the following nutrients: vitamin C (a must), taurine, lysine/proline, apple pectin, vitamin D, IP6 rice bran extract. Prescription of drugs that lower cholesterol and other typical cardiac drugs are frankly inappropriate as they do not address the primary cause of the coronary arterial blockage that could recur at any time after an initial heart attack. To make sense of all this, it appears heart attacks can be triggered in a short time. The mental image of a coronary artery slowly narrowing due to progressive accumulation of cholesterol over a period of many years which then results in a blood clot that blocks circulation to the heart is mistaken. Nor do cholesterol-lowering statin drugs reduce lipoprotein(a) and therefore don’t address the cause of the disease either. 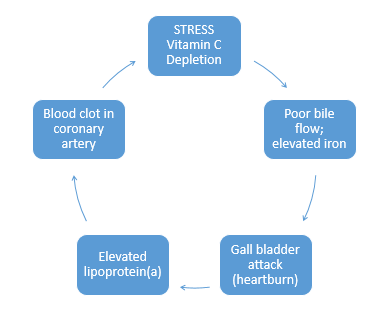 A shortage of vitamin C, which is depleted by smoking and stress, sets the stage for thick bile, poor bile flow, elevated iron levels and a rise in lipoprotein(a) in the blood circulation that then induces the blood clots that produce a heart attack, and all this can occur rapidly. — ©2015 Bill Sardi, Knowledge of Health, Inc.